Travel motion sickness is a term used to describe a combination of symptoms. Motion sickness is also referred to as seasickness, air sickness and car sickness, this is because motion sickness typically occurs when travelling. You can also experience motion sickness from an amusement park ride! The symptoms people experience includes, dizziness, sweating, vomiting and nausea. For some people the symptoms can remain for the duration for a trip, which could mean days! The motion you feel from a moving car, the rocking of the sea in a boat, or the turbulence in an aircraft can cause motion sickness. Children between the ages of 3 and 12 years tend to experience motion sickness more so than adults when travelling however anyone can suffer from motion sickness. Treatments can help prevent motion sickness from occurring before it starts and helps minimise the symptoms you are feeling once you have motion sickness. Medications help reduce the stimulation of the inner ear. The most popular treatments are antihistamine medications. The medications can treat the nausea and vomiting caused from motion sickness. 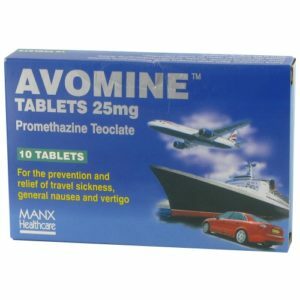 Avomine tablets are an antihistamine medication used to prevent motion sickness. It can stop the feelings of nausea and the urge to vomit. 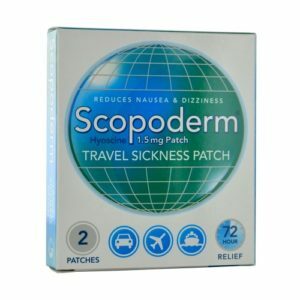 Scopoderm patches are applied behind the ear to help elevate motion sickness. You apply the patch approximately 4 hours before travel or doing an activity that involves a lot of movement. The body through the skin absorbs the medication slowly over the 4 hours. 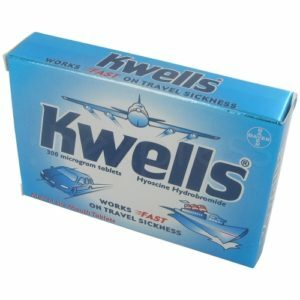 Kwells prescription tablets can prevent travel sickness from occurring. Kwells is extremely effective when taken 30 min prior to travelling. However they can be taken during a trip once you feel the onset of motion sickness. The brain picks up signals from the inner ear, eyes and deeper tissues of the body surface through the nervous system. When our bodies move intentionally (walk, run) the input from these 3 signals is coordinated. However if the movement is unintentional (on a boat) then these signals conflict causing motion sickness. Motion sickness is caused when the balance of the middle ear is disrupted. The repeated motion from rough sea, movement from a car or drop in pressure when flying affects the equilibrium within the inner ear. Can I buy treatments for motion sickness online? Yes. It’s always a good idea to stock up on medication to treat motion sickness before any trip. To buy medications online you will have to complete a free consultation. This is a simple process that takes a few minutes; replacing the usual face-to-face consultation you would have with a doctor. Once you have finished and been approved for the medication it will be sent out within 48 hours. Saving you time and money.